“I have no idea what you are talking about,” my non-writer companion calmly replied. Along the roadside, stalks of the purple and pink wildflowers known as lupine bloomed, looking like a come-to-life illustration from Barbara Cooney’s award-winning picture book, Miss Rumphius. As fellow fans of kids’ lit may know, this story’s title character longs to make the world more beautiful – and does so by scattering lupine seeds about her unnamed seaside town. Although I had read the book many times (and sources say it is set in Maine), this was my first glimpse of these distinct flowers growing wild in a similarly pretty, seaside location. 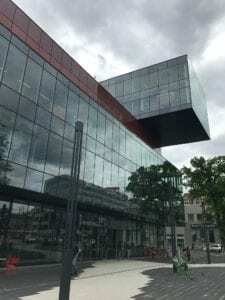 This was one of many delights experienced on my visit to Halifax, the capital of a Canadian province I always longed to visit. 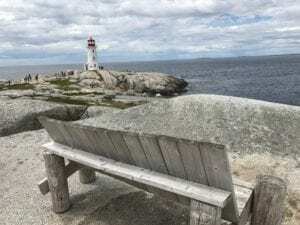 Truth be told I fell in love, sight unseen, with the province in which Halifax is located years ago, simply for the lyrical, ear-pleasing quality of its name – Nova Scotia. 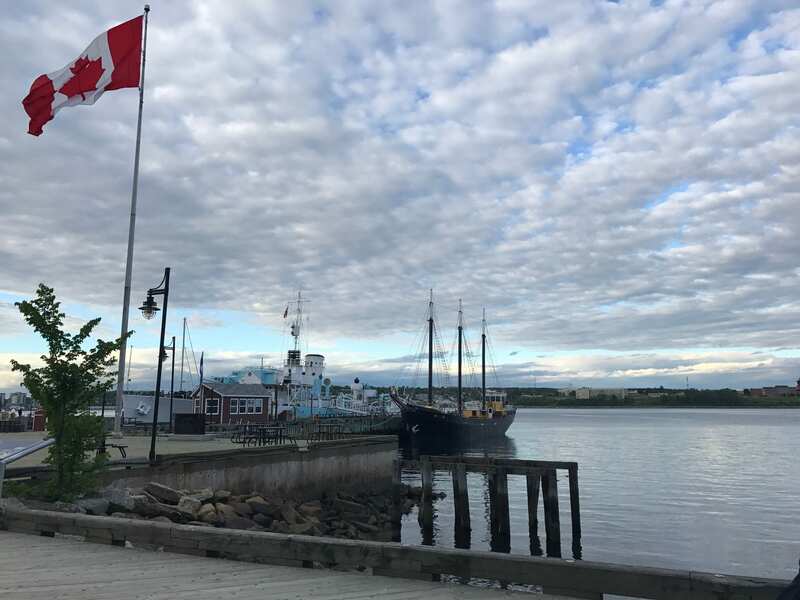 Halifax, situated on the Atlantic edge of Eastern Canada (and about 230 miles East of Bar Harbor, Maine as the crow flies) is known for fresh seafood and waterfront views. It boasts Canada’s oldest children’s bookshop and a magnificent library. To my mind, it also offers an extraordinary number of cozy, scenic or just plain welcoming places to pause with a pen or laptop to do what writers do. Here’s a sampling of places and pastimes that will beguile writers who venture to this lively, harbor-side city. Even the most dedicated wordsmiths have to eat. Stroll along the waterfront for a selection of restaurants serving lobster, oysters, crab cakes, handcrafted ales, gingerbread and blueberry desserts. Here one might glimpse all manner of vessels, including sailboats, tall-mast ships and the ferries that cross the water to the community of Dartmouth. Cruise ships, including Cunard’s majestic flagship, the Queen Mary 2, grace Halifax harbor (or harbour, as the Canadians spell it). The Casino Halifax, several shops, and the Maritime Museum of the Atlantic round out some of the waterfront offerings. 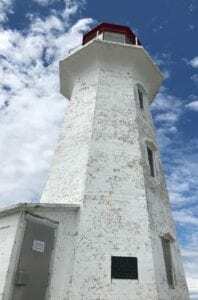 These charming sights, along with the salt-water scented air, may be just the thing to clear the head, opening up room for fresh, creative ideas to take shape. Tourism Nova Scotia website, novascotia.com. The spectacular views come with warnings, however, to avoid the wet and slippery rocks close to the water’s edge. A boon for writers – there are plenty of benches to safely view the scene and spend some time writing en plein air, if that’s your pleasure. 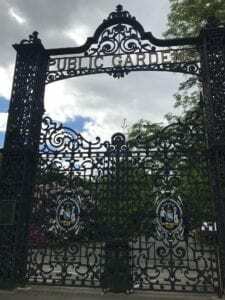 Back in the busy urban area, climb uphill to the Halifax Public Gardens for outdoor contemplation and inspiration. 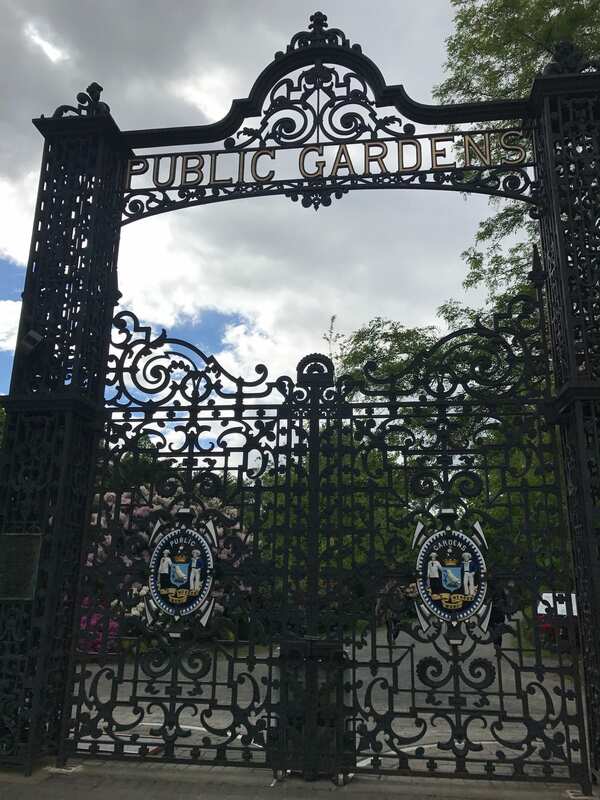 Beyond the intricate, black iron entrance gate, find flowers and walking paths, statues and yes, more benches, within this quiet and lovely Victorian-style garden. For fascinating, historic tales, continue uphill to the Halifax Citadel National Historic Site, situated just beyond the landmark clock tower. The current Citadel, built from 1828-1856, has protected this region and offers much to explore. An especially eye-opening exhibit of a replicated, WWI trench as used by the Canadian Army in France provides a realistic glimpse of this form of warfare, and how miserable conditions could be for the young Canadian soldiers engaged in it. Guides (some in uniform or costume) throughout the Citadel knowledgably share their insights on operations in the trenches, the challenges faced by WWI nurses, and the daily life of a sentry. 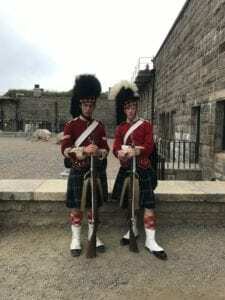 The Citadel also offers an Army Museum, bagpipe performances, and, for re-fueling, a coffee shop. If nothing makes you happier than writing in a pub (a practice that proved effective for at least one famous children’s author), you are in luck here. Halifax boasts “the most pubs per capita in Canada” according to novascotia.com. I quite liked “The Wooden Monkey” on Grafton Street, which offers vegan and other dishes, a cozy interior and a large, old-fashioned mural of two men drinking from tankards at a pub table, perhaps ruminating about the book one holds prominently. Cheers! And on the subject of books, the new, five-story Halifax Central Library stuns even before you step in the door with its imposing size and innovative architecture – it is said to look like a stack of books. Upon entering, you can’t miss the eye-catching art installation Library Cards by Cliff Eyland, with 5000 wall mounted works of art, each the size of the traditional library card catalog card. Inviting cafes can be found on both the ground floor and the fifth floor, but opt for the latter with its outdoor dining area overlooking the city. I spent a happy hour within the library’s second floor children’s section, seeking books marked with a maple leaf on the spine. This symbol denoted Canadian-produced books and presented stories I had not found in libraries in the U.S. I curled up in a seat before a large glass window and dipped into these enchanting tales. Highlights include sites where Oscar Wilde spoke, Charles Dickens visited and Lucy Maud Montgomery (author of the Anne of Green Gables books) worked as a newspaper columnist. 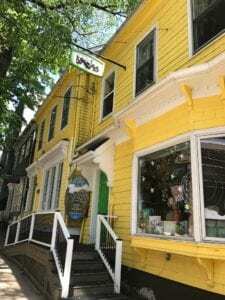 Finally, how could any children’s writer pass up a visit to what claims to be the oldest children’s bookstore in Canada – the wonderfully whimsically named Woozles. Inside the bright yellow converted house, I strolled the toy and book collections and found a most satisfying souvenir among the “local” section. Bright illustrations of familiar Nova Scotia sites, depicted during the day and then at night, fill the pages of the picture book A Nova Scotia Lullaby by Terrilee Bulgar and illustrated by Perry Craig. 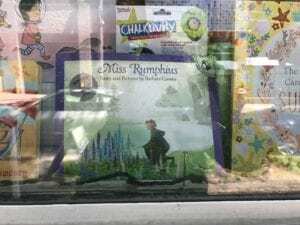 As I left Woozles happily carrying my purchase, I glanced for the first time at the shop’s front window. 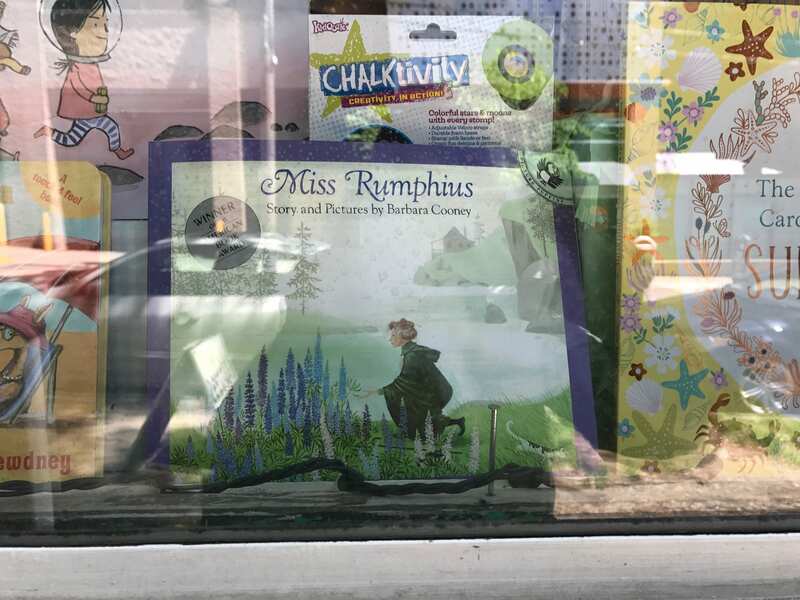 To my surprise, prominently showcased in the display was the picture book Miss Rumphius. The cover illustration depicted the title character among the lupine by a green and rocky coast, smiling with apparent contentment. I could totally relate. 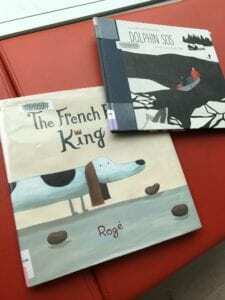 An ongoing blog series by children’s author Catherine Stier chronicling travel destinations from a writer’s eye point of view, as well as other topics in which the subjects of travel and writing/reading kids’ books intersect.